The Paul N. Gardner Company is pleased to include an advanced automatic version of the time honored Sward Hardness Rocker in their line of instruments. There are two major advances. The fabricated and assembled parts of the rocker are replaced by a single frame, machined from a solid metal bar. The two bubble levels for determining the high and low limits of swing are replaced by Mems Accelerometer which, through electronic circuitry, automatically register the swings on a large character liquid crystal display digital counter. Ring Radius (R1, R2) Between Instruments: 2.000" ±0.010"
Ring Radius Match (R1, R2) Each Instrument: Within 0.002"
Ring Concentricity (C/R1, C/R2): Within 0.002"
Ring Separation (X) Between Instruments: 1.000 ±0.005"
Ring Separation in Arc of Ring Contact (S): Within 0.002"
Ring Cross Section Outside Radius (r): 0.0155 ±0.0001"
Energize the digital counter. This is done by placing the black switch on the back of the instrument in the "up” position. Normally, when energized, one or more of the “0” digits will change to another number. Place the rocker on a test surface and rotate it to the left to an angle greater than where count starts. This is over 22 degrees. All numbers on the display will return to zero. Release the rocker. As soon as the swing amplitude reaches the high set limit, the counter automatically registers each swing cycle and continues to do so until the swing amplitude drops below the low set limit. This count of swing cycles between the high and low set limits remains on the display until further action is taken by the operator. To repeat a reading, simply rotate the rocker, as in step three above, and repeat step four. At the conclusion of a series of tests, return the switch on the back of the instrument to the lower position and place the instrument in secure storage. Replace the battery if the count is erratic or becomes dim. Under normal conditions, a fresh battery should provide about 400 hours of count operation. 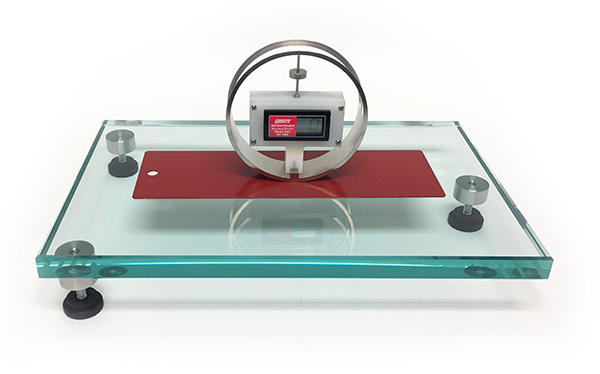 The Rocker is calibrated by the manufacturer to record 50 ±1 swing cycles in 60 ±5 seconds on the plate glass surface of the leveling plate used by the manufacturer and when operated in accordance with the detailed instructions furnished with the instrument. 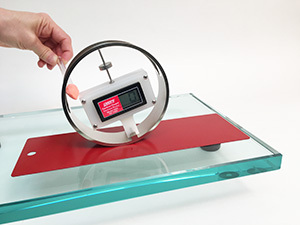 The hardness rocker is very sensitive and may not give exactly the same readings on other plate glass surfaces even when cleaned in the same manner or when readings are taken in different directions on the same glass surface. The Gardner/Sward Hardness Rocker is a delicate instrument. 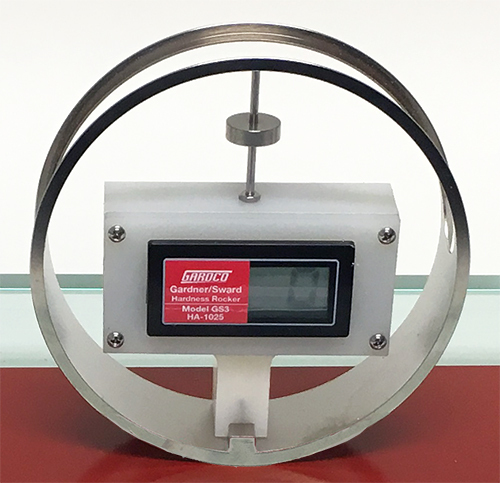 Any scratches or nicks that occur by improper handling on the ring radius in the arc of sample contact area may change results obtained by the instrument. There is no way of removing such damages without changing the original sensitivity, calibration and function of the instrument. This instrument should only be handled by qualified personnel. Do not use any type battery for replacement other than catalog number (HA-1023/B) listed in price section. A true and reproducible radius of the rings as shown in View (B) of Fig. 1. An enlarged optical comparator cross section view of an earlier Sward rocker ring at three locations within the sample contact arc (S) of Fig. 1, with a true radius included for comparison, is shown in Fig. 2. Circles shown in Fig. 2 are optical comparator reference rings. Exact concentric alignment of the instrument rings (C/R1 and C/R2 of Fig. 1). This true alignment was almost impossible to attain in earlier rockers with the assembly of separate rings attached with spacers. Exact and true separation of the instrument rings insured by a continuous metal web on the lower half of the rocker. The Gardner/Sward Hardness Rocker has a cross section ring area with horizontal as well as vertical segments (View “A” of Fig. 1). This design provides the strongest possible rings while retaining the same area as earlier instruments. Bubble levels, of earlier instruments, for determining the angles where cycle count starts and stops are replaced with Mems Accelerometer and the cycle count automatically starts at the high setting and stops at the low setting. 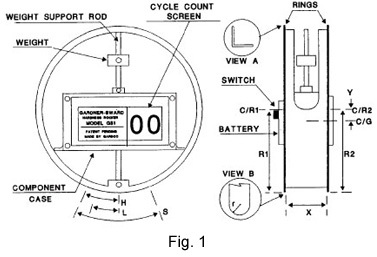 This cycle count is registered on a large liquid crystal display (LCD). High and low angles (“H” and “L” of Fig. 1) for the cycle count are set at the exact specified angles by the manufacturer. The demanding operator task of observing bubble position and counting cycles during the testing procedure is completely eliminated. The operator simply rotates the rocker past the angle (H of Fig. 1) where count starts and releases the instrument. This motion resets any digits showing on the display to zero. Automatically, the instrument starts registering cycle counts at the high set angle (H) and stops at the low set angle (L). This cycle count between the high and low set angles is held on the display until further action is taken by the operator. Leveling Plate: Annealed glass plate 3/4" thick, 8.25" wide by 13" long polished flat, it is fitted with three leveling glides. With the circular level (included with HA-1025) the level accuracy can be verified. Flattening Plate: This plate is used to flatten the test sample and hold it firmly against the surface of the leveling plate. Weight of the plate, about 4.5 pounds, also acts to dampen minor external vibrations. It is machined from steel and is plated. There is a window, two inches wide and three inches long, in the center of the plate to receive the hardness rocker. The ends of this window are machined to a two inch radius, matching the dimensions of the rocker rings. This permits maximum control of the test surface and prevents possible nicking of the rocker rings. The plate is 5.0 inches wide, 10.0 inches long and 0.37 inches thick. There is a lifting knob at each end of the plate. Draft Cover: Internal dimensions of the draft cover are 6.5 inches wide, 11.0 inches long and 4.5 inches high. It is constructed of rigid clear plastic. An opening is cut in the center of the cover top, one inch wide and four inches long. This opening serves to assist lifting the cover and to permit starting the rocker with the cover in place. Wand: The wand is a simple convenient item to assist the operator in the starting of the rocker with the draft shield in place.